Angel in the bottle concept art. This tutorial shows you how I paint with limited value and color range. This time I am experimenting with limited range again because it is a good practice. It takes less time to finish and possibly easier. What that mean is I have limited range of light and dark to painted with, including color palette. This one I choose cool range toward blue gray. If you look at your HSB (Hue, Saturation, and Brightness), the range of B I am painting with is between 30 and 85, no more and no less. It is still a very wide range of value I can use. Some time soon, I will experiment with narrower range. This concept art I have is probably not what you have in mind of a typical angel in the bottle or genie in the bottle. I have an idea that set in the past, a native American discover an ancient object. He opened it then an ancient Mage like angel appears. 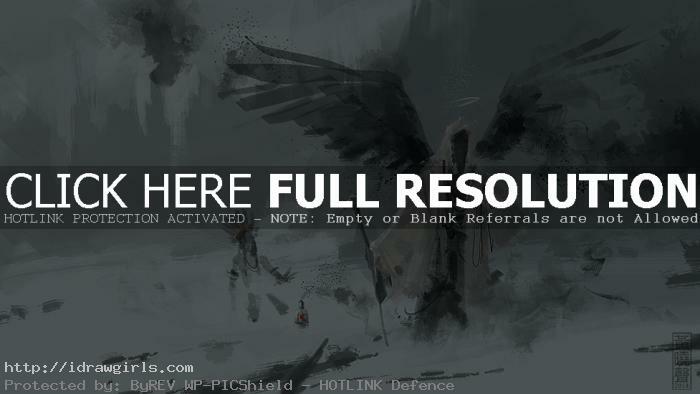 Below are step by step how to paint Angel in the bottle concept art.